As Netflix continues its recent voyage into millions of homes in Western Europe, CEO Reed Hastings revealed last week that the streaming service is aiming to land in a third of international TV households within seven years of each respective country’s official launch of the service, vastly increasing its subscriber base. Hastings discussed the projected goal at the CTAM Eurosummit event in Copenhagen last week, according to Advanced Television. Drawing upon the projected goal in Hastings’ keynote speech, U.K.-based research firm Digital TV Research now estimates that by 2020, Netflix will have picked up roughly 104 million international subscribers spread across 308 million TV households. Netflix has recently set out on a series of new European launches, beginning by opening up for business in France last Monday. Moving deep into the region this month, Netflix’s latest additions include France, Germany, Austria, Switzerland, Belgium, and Luxembourg. Those add to its presence in the U.K. and Canada, Nordic countries like Sweden and Norway, and several countries in South America. 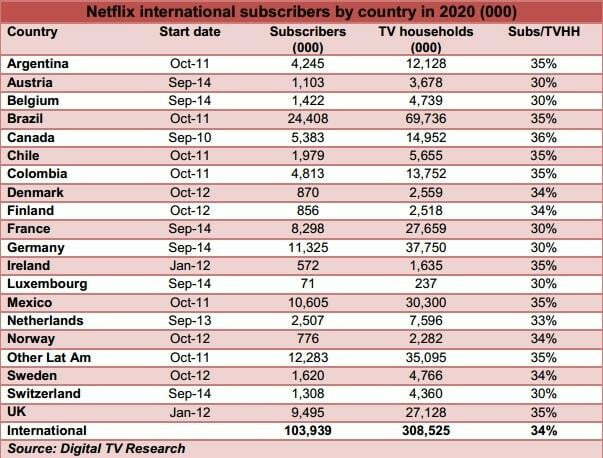 TV households overseas have already been predicted to become a major source of paying subscribers for Netflix, with data from IHS indicating that European subscribers could make up as much as 20 percent of its subscriber base by 2015. While these numbers are somewhat staggering considering how quickly the subscriber numbers are projected to rise, the predictions may not come as much of a surprise to some experts and analysts. Netflix announced back in February that it was taking on an additional $400 million in new debt in part to aid in its conquest of Europe. The new estimates from Digital TV Research seem to show that Netflix’s cash infusions could pay off big in the long run. For example, the firm predicts that Netflix will have secured roughly 8.3 million new French subscribers across 27.7 million TV households by 2020. Below is a table of the firm’s projected figures for each nation with official Netflix service outside of North America. Of course, these are all predictions, and Hastings may have been slightly bullish in his estimates. After all, he was speaking directly to some of the international television industry’s biggest players, including potential investors and competitors. Still, the company has been impressively on-the-mark when it comes to its predicted expansion thus far. Considering international subscribers will be key to the financial security of Netflix in the coming years, it is likely that it will continue to push into households at a rapid rate, ensuring its place as one of the most dominant services of its kind on the planet.